It was the fourth year of the Great Depression. The unemployment spiral continued downwards, millions were jobless. There was a feeling of hopelessness; especially among a young and untried generation. Something needed to be done . . . and quickly. By the 5th day of his first term, Franklin Delano Roosevelt (FDR), 32nd US President was setting in motion what is now recognized as the “single greatest conservation program in American history”. 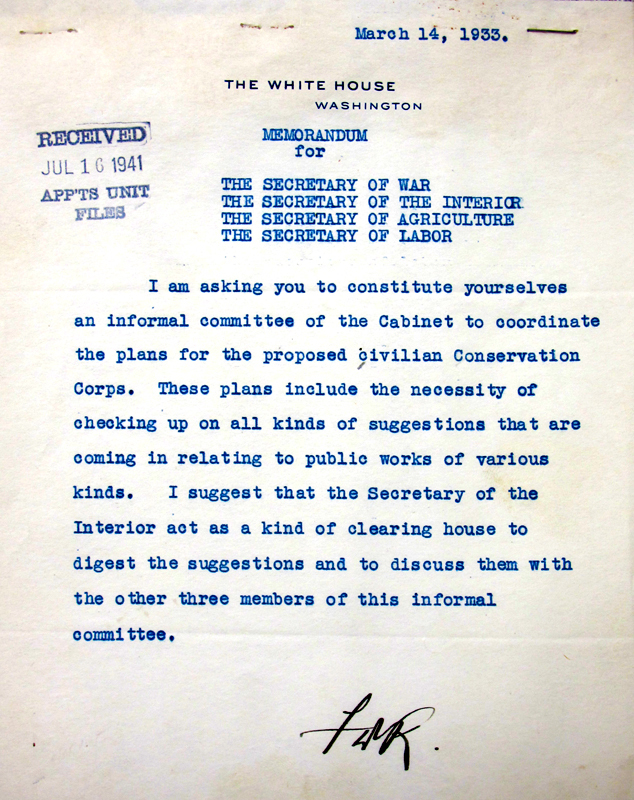 The Civilian Conservation Corps – CCC . It would become the first and most successful of the New Deal work programs. By the 1oth day FDR signed four memos with a simple directive – “coordinate the plans”. The memos were addressed to members of his cabinet. George H. Dern, Secretary of War, Harold L. Ickes, Secretary of Interior 1933-1946, Henry A. Wallace, Secretary of Agriculture and Frances Perkins, Secretary of Labor 1933-1945. This historic memo gave the four cabinets members powerful authority and a daunting task . 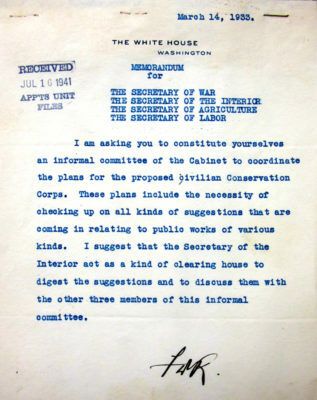 . . they were to investigate and draft legislation which would allow the immediately implementation the first of the New Deal work programs, the Civilian Conservation Corps (CCC). So much was riding on this untried idea.